Saint Charles Christian Church - PWArchitects, Inc.
Saint Charles Christian Church is the first church to be constructed in the New Town development in St. Charles, Missouri. The design of this church respects the historic nature of the surrounding community while providing a floor plan and technology for a variety of needs and services. 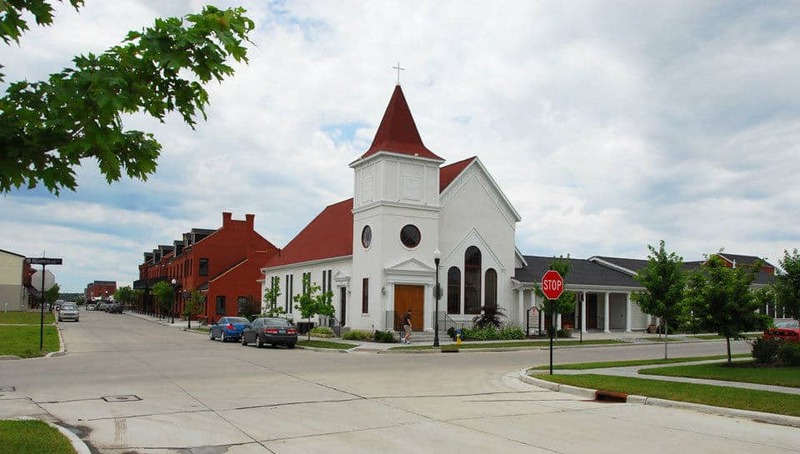 The church includes a high-performance energy system and a number of quality building materials including Kolbe Windows and Hardiplank siding. The site plan allows for some future expansion and landscaped areas for outdoor activities. The Sanctuary includes seating for 300, a full immersion baptism font and a sound board for control of acoustics. The Narthex can be accessed from the street or the courtyard side and is served by a pass-through from the kitchen. The colorful classrooms serve children of all ages, and the offices serve the needs of the Pastor and the church business operations. $1 million with donations of land, labor, and materials.